The beginning of an adventure: I was going to roam around Tokyo on my own and find my way around the underground. It appeared daunting at first: many stations use nothing but Kanji for signs and ticket vendors; it is easy to get confused between the local and express, limited express and God knows what else, between train and underground, not to mention all the line names. But I pride myself on my resourcefulness, and with the help of my sketchbook where I plotted the lines in English and Kanji, and of the impeccable Tokyo signage system, I was feeling at home in no time. I returned to Takashimaya: the lower ground floor is a huge supermarket where I wandered for an hour among the most incredible packages I had ever seen. I felt like Alice in designer wonderland! 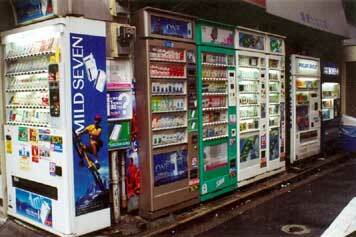 The streets of Tokyo everywhere are lined with row upon row of vending machines that offer anything from drinks to hot noodles (even books and rather unbelievable things in some places), and I made an abundant use of them – purely for the packages. I brought home 15 cans that had contained iced tea, flavored water or such. Tasting them was an act of bravery: there's absolutely no way for a foreigner to know what's inside them. I finally made it to Daiken-yama where I got to taste the delicious nâshi, a local fruit that tastes like something between an apple and a pear. My cousins took me shopping in Shibuya, among other things to a wonderful place: the 100 Yen Plaza! I had dinner with them and when I took the train home it was nearly 11 at night. That in itself was ok -- Tokyo is a safe city and I felt no discomfort at being alone on the streets at night. However, I had made a mistake: I hadn't noted our apartment's address and phone number, so that in case I got lost, I could show them to someone and get guidance. And get lost I did! A mixture of intuition and luck got me home safely, but what a dumb thing to do. Needless to say the lesson was well learned. As swordsmanship fans, Anne and I had set the morning aside to go to the Japanese Sword Museum (Nippon Bijutsu Tôken Hozon Kyûkai). Getting there was no small feat. After walking in circles for a while we asked our way inside an expensive-looking pottery shop. The elderly gentleman showed enthusiastic courtesy, going so far as to make a color photocopy of a map he had for us. That map was scary-looking to me. Japan doesn't use street names, but rather chops the city into areas, themselves divided into smaller areas, etc. The smallest units are numbered, and the numbers are not necessarily next to each other. We made it nevertheless, and I was surprised to see such an important museum so discreet, almost hidden in the maze of small streets of a residential area. It is small, with just a single exhibition room, but it contains national treasures. We then headed to Takashimaya, again! While Anne went to work (she taught English) I went to search for another museum, this time one of paper. How my quest went along is summarized in my journal: "AAARRRRGH how can the biggest paper museum in the world be so hard to find?" Indeed I took the train to one of the remotest areas of Tokyo, then went out and got lost. I ended up entering a fashion school to ask my way. Very few japanese speak English, even in Tokyo, and I can't blame them: when you understand how Japanese works, you realize how very complicated English must be for them. They try their very best to help, though, and I got the directions I needed. I had been walking away from it! I returned to the station and climbed a flight of stairs that zigzagged uphill between trees. I'd never have thought that was the right way, as it looked for the world as if they were heading straight into a forest. It turned out, they did, but the forest was a park at the edge of which I finally found my museum. The museum was entirely in Japanese, but a very detailed leaflet in English is distributed at the entrance. It almost makes the visit of the museum unnecessary! The best part was the museum shop, that has a small but beautiful selection of Japanese papers. They are works of art and I almost daren't use them. Here is a more in-depth article on Japanese paper and its uses. It's when I got home and told Tacchan I had been to Ôji that I realized how far I had been. His reaction was: "Ôji?? What on earth took you all the way to Ôji?" I was on my own again for the day. 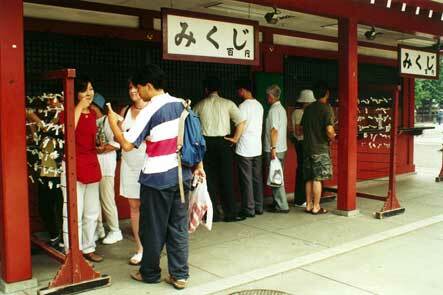 Anne recommended I should try and go to the shrine at Asakusa. It instantly became one of my favorite spots in Tokyo. 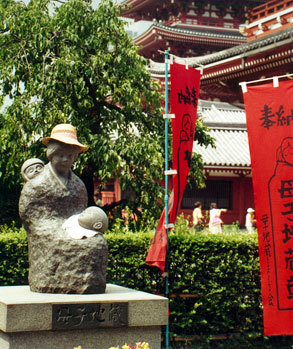 Asakusa is the temple town around the Kinryûzan Sensôji Temple, better known as Asakusa Kannon. This temple complex is what got my heart. On exiting the subway I wondered if I'd manage to find it, but my concerns were put to rest immediately: the gorgeous Kaminarimon gate was visible all the way down the street. 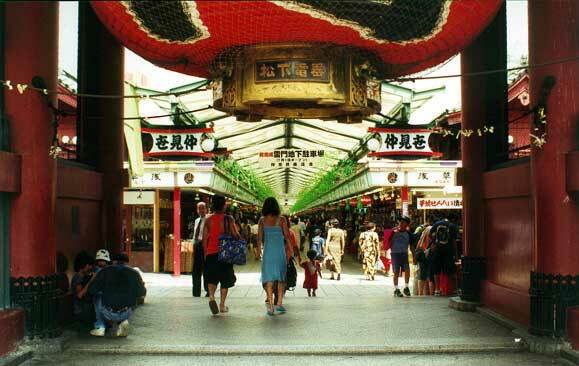 Entering under the large lantern, between Fûjin the God of Wind and Raijin the God of Thunder, one steps right into a long market street, Nakamise-dori, that has been there since the early Edo period (1600-ish), and where every kind of traditional artifact is sold. I had the time of my life. Kimonos, lucky charms, umbrellas, fans, foods, dolls, I filled my eyes and shopping bags. The beauty of it is that these objects are not made for tourists, who were still quite rare at the time. 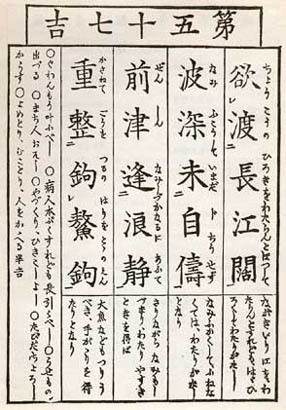 The Japanese buy and use them themselves. At the end of the shopping district the street opens into a wide court framed by stately structures and small statues playing hide-and-seek throughout the compound. 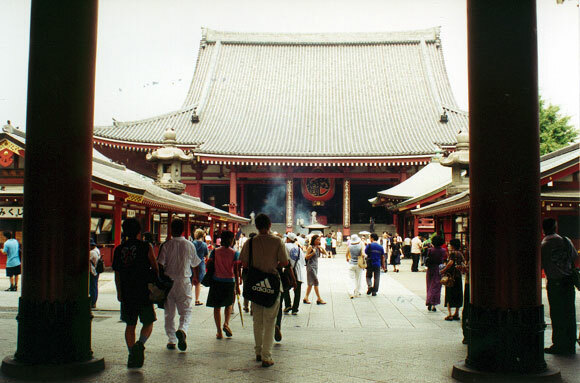 The place was crowded with visitors who came as much to enjoy their day as to pray in one of the many shrines. The extraordinary red shone above everything else. 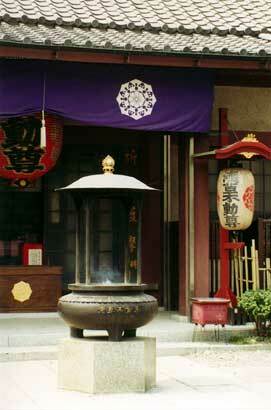 -- Is it the bell in Ueno or Asakusa? 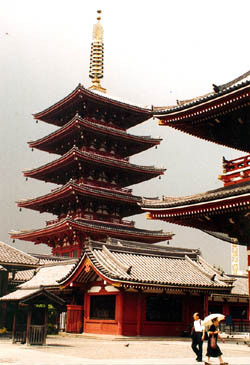 he most spectacular construction in the compound is the five-story pagoda, originally erected in 942. 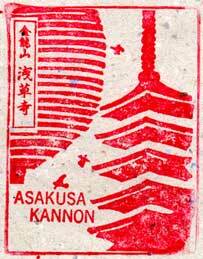 Both it and the original Kannon were actually lost to fire during World War 2, and rebuilt afterwards. 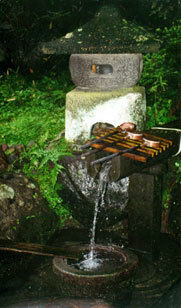 The precinct also includes such precious concepts as shrines to honor used pins and needles, fans used in dance, hand-copied sutras, and Soeda Chûdo's writing brush. 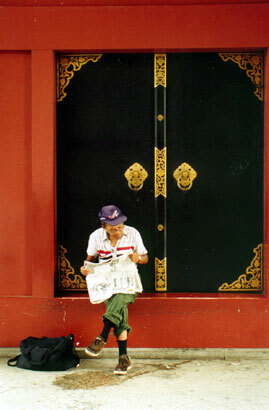 I was charmed by the many holy statues wearing aprons or hats that populated the bushes of the precinct. "It is almost impossible to cross a river too wide, waves are hard all over the river, you can't get to the other shore without a boat. But if you get a chance to cross the river when waves calm down, you can get a powerful means to pick up a giant fish." 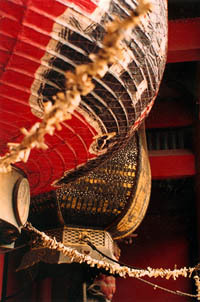 Inside Asakusa Kannon there is a small booth where a monk sells devotional images and objects. 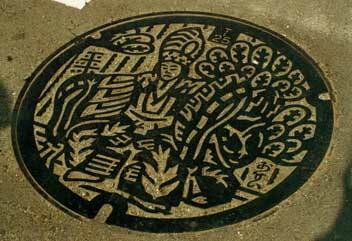 In the Japanese tradition of playfulness, there was a stamp for visitors. The monk laughed when I didn't stamp it hard enough the first time! 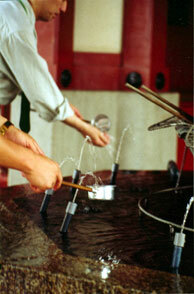 An unavoidable feature found in every single shrine in Japan, no matter how small, is the ablution fountain (below) with its spoon-cups – a single one or a multitude of them, as was the case in the large basin of Asakusa. Outside, a little girl came up to me and said in a careful English: "Good morning, what is your name?" Apparently her mother had sent her, and she arrived herself immediately with an adorable little boy. She said something to the girl and she asked again: "Can we take a picture with you?". I don't know why she wanted a picture of her kids with me (maybe it was the hair), but I gladly complied.